Falana calls for Probe of Former Minister of Finance Ngozi Okonjo-Iweala over her role in Dasukigate. 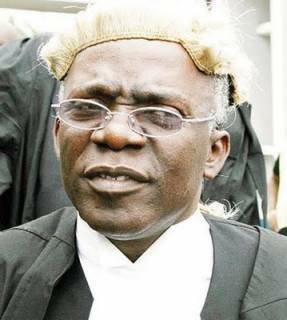 Lagos lawyer, Femi Falana (SAN) has asked the Economic and Financial Crimes Commission (EFCC) to investigate the alleged diversion of over $4 billion recovered by the government from the late General Sanni Abacha loot by former Finance Minister and coordinating Minister of the economy, Dr. Okonjo-Iweala, the former National Security Adviser, Col. Sambo Dasuki (rtd) and other suspects. According to a statement, Falana in a letter dated December 18, 2015 requested the EFCC to conduct the investigation following a briefing made last week by the Accountant-General of the Federation to the National Economic Council on the Abacha loot. The Accountant-General of the Federation was said to have claimed that the Federal Government had recovered $2billion from the Abacha loot. Falana said he therefore decided to petition the EFCC since there was evidence that over $4 billion had been recovered from the Abacha loot. To aid investigation of the commission, the lawyer forwarded a copy of the Forfeiture Assets Decree No 55 of 1999; Press statement of the Federal Ministry of Justice on the Abacha loot and photocopies of pages 494-496 of Chief Obasanjo’s book entitled “My Watch”. The learned silk recalled that following the death of the then military Head of State, General Sani Abacha on June 8, 1998, his successor, General Abdulsalami Abubakar ordered a probe into the looting of the Central Bank of Nigeria from 1993-1998. “At the end of the enquiry it was established that the late dictator stole about $5 billion from the vaults of the CBN through his National Security Adviser, Mr. Mohammed Gwazo. A substantial part of the stolen fund has since been traced to over 140 bank accounts in western countries and some remote islands in the world. “Based on report of the investigation the Federal Government recovered $635 million, £75 million, DM 30 million and N9 billion as well as several vehicles and properties in Abuja, Lagos and Kano together with 40% interests in West African Refinery in Sierra Leone. Other assets were recovered from the family and associates of the late General Abacha. The forfeited assets were promulgated into law and signed by General Abubakar on 26th May, 1999. “ I have since confirmed that all the funds and assets listed in the Schedule to the Forfeiture of Assets, Etc. (Certain Persons) Decree no 53 of 1999 had been recovered and forfeited to the Federal Government”. Falana also recalled that the Olusegun Obasanjo Administration embarked on the recovery of the remaining Abacha loot pointing out that “at page 495 of the second volume of his book entitled “My Watch” former President Obasanjo stated that “…by the time I left office in May 2009 (sic), over $2 billion and £100 million had been recovered from the Abacha family abroad, and well as N10 billion in cash and properties locally.” The vital role played by the Economic and Financial Commission in the recovery of the fund is acknowledged in the book by the author”. He also noted that under the Goodluck Jonathan administration, the recovery efforts continued and over $1 billion was recovered. “In justifying the withdrawal of the theft of N446 billion against Mr. Mohammed Abacha at the federal capital territory high court, the then Attorney-General of the Federation, Mr. Mohammed Adoke SAN said that it would ” facilitate the recovery of the sum of $380 Million US Dollars from the Luxembourg proceedings and $550 Million US Dollars from forfeiture proceedings instituted by the US Department of Justice. Falana alleged that in a desperate bid to cover up the gross mismanagement and criminal diversion of the Abacha loot, former Minister of Finance, Dr. Ngozi Okonjo-Iweala had repeatedly maintained that only $500 million had been recovered by the federal government. To lend credence to the fraudulent claim the World Bank confirmed, in a reply to an enquiry by SERAP, that the $500 million recovered from the loot had been judiciously spent on some phantom development projects in several parts of the country. “ But following the recent revelation by the Premiumtimes that a substantial part of the loot had been criminally diverted, Dr. Okonjo-Iweala has admitted that she transferred $322 million from the Abacha loot to former National Security Adviser, Col. Sambo Dasuki to prosecute the war on terror. Apart from the said sum of £322 million Mrs Okonjo-Iweala also released £5.5 million pounds to Col. Dasuki”. Falana said Okonjo-Iweala’s excuse that the said sum of $322 million was released due to the urgency of the crisis in the north east region was untenable having regards to the fact that former President Jonathan had sought the approval of the National Assembly to take a loan of $1 billion to equip the armed forces to fight insurgency. “Therefore, the self-induced urgency created by Mrs. Okonjo-Iweala is not a justification for spending public funds without appropriation. It may interest you to know that the sum of $500 million allegedly spent on development projects was also not appropriated by the national assembly”. He said that unless the Abacha loot is fully accounted for, the Buhari administration will find it difficult to receive the cooperation of many governments in the ongoing efforts to recover the stolen wealth of the country.